Robert Hayden’s sonnet “Those Winter Sundays” offers a meditation on the fraught love between fathers and sons. 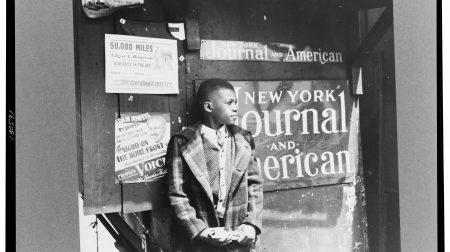 Conjuring Depression-era industrial Detroit and the struggles of early 20th-century African Americans, the poem’s universality makes it one of the most beloved poems in the American canon. Vice President Joe Biden, Inaugural poet Elizabeth Alexander, and psychologist Angela Duckworth join a chorus of working fathers and sons to reflect on Hayden’s moving poem. “Those Winter Sundays” from Robert Hayden’s COLLECTED POEMS, 3rd Edition, reproduced with the permission of W.W. Norton & Company, Inc. Host Elisa New considers the rise of the skyscraper–and the emergence of the modernist poem–in an episode featuring celebrated architect Frank Gehry, Chinese visionary and real estate developer Zhang Xin, poet Robert Polito, and student poets from around the United States. Last month, the Poetry in America team headed to Washington DC for one of our most exciting conversations yet: a discussion with Vice President Joe Biden on Robert Hayden’s “Those Winter Sundays.” What would the Vice President have to say about the father/son relationship in Hayden’s poem?